Every girl can become a force for change. To unlock her potential, she must have the opportunity to go to school and build the skills and confidence needed to meet life’s challenges head on – whether she lives in Manhattan or Mali. Girl Scouts of the USA and CARE are kicking off a ground-breaking partnership that puts girls at the heart of a conversation about the most important issues of our time. The partnership – called The Power of Girls – will connect girls worldwide and mobilize them around important global issues, including the critical role that girls’ education and leadership plays in addressing poverty everywhere. The event includes Discussion, moderated by MTV News Correspondent SuChin Pak, with Oscar-nominated and Emmy-winning actress Shohreh Aghdashloo (The Stoning of Soraya M, House of Sand and Fog, Sisterhood of the Traveling Pants, ABC hit series Flash Forward), Guest Speaker Ann Shoket (Editor in Chief – Seventeen); girls’ education and leadership experts from CARE, Girl Scouts Research Institute and Population Council; on-the-ground perspective from the director of CARE Afghanistan with support from The Documentary Group. There will be Live conversation via Intel-powered classmate PCs with Girl Scouts in New York and girls in a classroom in a developing country who will discuss solutions to global girls’ issues. 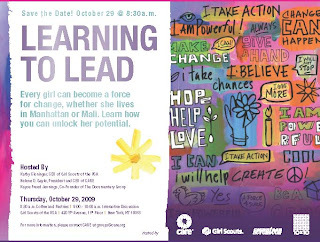 It will also stand as the launch of The Power of Girls pledge that urges American girls to learn about issues affecting girls worldwide, share their findings with friends, and take action – supported by Seventeen Magazine.